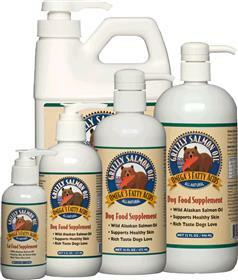 Salmon oil nutrients support your dog's immune system, natural joint health, cardiovascular health and high-energy level. Grizzly contains arachidonic acid to sustain vital metabolic functions. I use it as an addition to my raw diet for my dogs but it makes a great addition to any diet. Great product for the skin & fur. My little chocolate lab is a service dog, and will need to be in good shape to work with me. The grizzly salmon oil helps her immune status, joints, cardiovascular system, and she has the most amazing glossy dark chocolate coat. She's quite a stunner! Thanks, Grizzly Salmon Oil! My dog has very dry skin and this product stops her from itching and gives her a gorgeous coat! Our pooches lap this stuff up, on recommendation of our vet. Everyone comments on how soft and shiny their coats are, and how strong their nails are. Our 2 dogs are 7 years old, on a raw diet, and have never had any health issues. Thank you Grizzly! This oil gives my plush coated Shiloh Shepards a beautiful, shiny, silky soft coat...won't feed them food without adding this...ever! I have used this product for several years and your site offers the best deal. Obviously it's smelly, I put it on my dogs food thinking, "I dn't know if she is gonna eat this" ...She did, and after she must have spent an hour licking the bowl, after every feeding! For something your dog will like and something you can easily add for whatever reason may be (shiny coat, better skin) Great product! We have three dogs and give this to them every day. I think it really does make a difference in their coat and I feel like they are really getting the nutrition they need by adding this to their food. We buy the big one because it is definitely the best value! Grizzly salmon oil is a staple in our house. My dalmatian had patches of fur missing and i was desperately looking for something affordable and edible. I originally looked into external treatments but this just made sense! my dog loves it and waits for me to dose some on his kibble. In just a month he had a beautiful coat. Shiny, and healthy. I am a life time user from now on! --my only little issue was his smelly fish breathe when he first started taking it. He would burp and it would be horrible! but as his body warmed up to it. that went away. I have 2 male labs (2 1/2 year old and 1 year old). My younger lab has dry skin. I started getting this for his benefit, but the older one loves it too. I've tried a few other brands, and they really didn't care for them. My younger guy's coat is gorgeous, shiny and no more dry skin. I tried the Grizzly Salmon Oil back in Jan, because my black lab's skin was constantly flaking. Since trying this product, no more flaking. Since, I have gotten another black lab. I put this on her food too, and no dry skin on these dogs. I have been adding this brand of Salmon oil to my dogs and cats food for a few years now, they love the taste, but I find that it helps their skin and hair look the best, plus its excellent for organ function! I love the large 64oz size bottle with easy use pump...no mess no spills with easy controlled dosage. Dog likes the taste. Awaiting improved hair coat-only used it for two weeks. My dog loves and we are happy with results. His coat is not as dry as it was in the past. I am currently giving this as a treat on my dogs food they love it. Their coats have improved. My Catahoula is a constant shedder all year long. Since he has been given this oil on his food his hair has not been shedding like it used to in fact I hardly pulled any out when I brushed him last where as I used to pull handfulls of hair each time I brushed him no matter how many times I brushed him. My lab who was getting sores on her and has itchy dry skin has also seen an improvement. Her sore is gone and her coat is also starting to gleam. No more itchy dry skin. My pomeranian's coat was fairly dry looking and is now looking more radiant and healthy. my boy's coat has always been nice until this winter. He had horible dry skin and his shedding was non stop.Once I started with the Griz Oil the shedding slowed way down after about two weeks on the product. It took a month to see a difference in his dry skin and while not gone it is much better. I would recomend this product. This product is great for my Golden Retriever's skin care and he has it every day, so I was VERY happy to get a great price for the product, but even happier to have it cone in a timely manner. This was my first time ordering online with Natural K9, so it was a good experience for me. Very happy with this product and the pricing. Using it for 3 dogs and a cat. Noted improvement in their coats. My 3 yr old black lab has been using this oil since birth. She gobbles it up without any hesitation (as she does all food). Natural K9 had the best price and shipped it right away. I'd buy it from them again! We bought this salmon oil for our dog because his skin was irritated and we were hoping to booster him with fatty acids. It seems to have worked and also made his fur softer. We think it is also making a bit of a difference with his joint mobility and his ability to bounce back after long days of hiking (he's just about 7 years old and weighs in around 80 lbs). I highly recommend this product especially at this price ( I shopped around).